Hello up there! Fortunately Mr. Menz is not afraid of heights. Here he is overseeing the resealing of the Adams building's brick façade. The Adams building also got new, energy-efficient exterior LED lighting. As usual, WSL's Facilities Manager Paul Menz has been busy this summer with a list of projects as long as his arm. We caught up with Mr. Menz recently, which isn't easy as he is always in motion getting things done. WSL: Mr. Menz, do you ever sit still? PM: Not in the summer, that's for sure. Except for the one week I spend up in Maine. WSL: What have you been working on while the rest of us have been at the beach? PM: We've been in every classroom, every hallway, and all over the grounds. The Adams building is over 100 years old, so we work hard to keep it in good shape. This summer the biggest project was probably replacing the original slate blackboards. WSL: You've been at the Waldorf School of Lexington since 1998...what's the best part of the job? PM: The variety. It's not a 9 to 5 job where you do the same thing every day. There's always a new challenge, which keeps it interesting. When you see Mr. Menz, please thank him for taking such great care of our historic school buildings and grounds! Julius van den Broek (6th Grade Class Teacher Paula van den Broek's son) and Gabriel Brown (Senior Staff Accountant Mark Brown's son) did a lot of heavy lifting this summer. All the elementary classrooms plus the orchestra room now feature brand-new blackboards! Thank you to all the generous donors who made this important project possible. Garden beds were weeded and replanted, bushes were pruned, and the grass was kept alive through the severe drought. Special thanks to parent and incoming board member Demetra Restuccia, who designed new landscaping for the front of the Adams building. 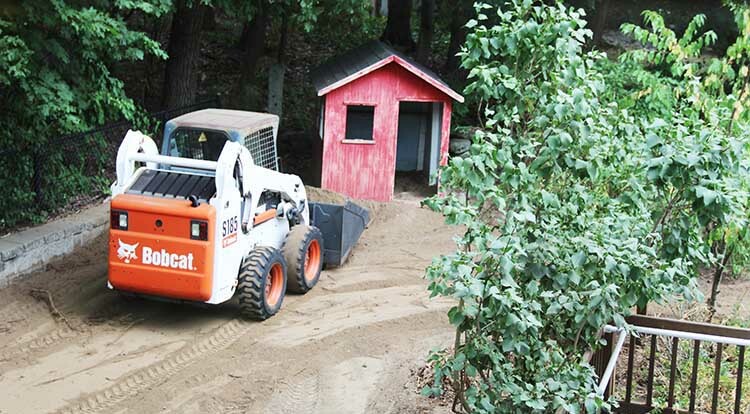 The nursery yard was completely regraded to improve drainage, and new fencing was installed. WSL's kitchen got a thorough scrubbing, and new cabinets are being installed. All the hand-crafted wooden desks were refinished so students have beautiful work surfaces. Sheetrock for the blackboard project is hoisted in through the math office window. The tutoring room got four new windows. In addition, many of the beautiful original windows in the Adams building were taken out and the counter-balances replaced to keep them opening and closing properly. Other improvements include a new electrical panel in the auditorium, new radiator covers where needed, additional wall padding in the gym, and a new ceiling and upgraded lighting in the sixth grade classroom. Plus all the usual repairs, painting, and floor refinishing that make the school shine. We're ready to welcome you back to school! Filling the stage in their finest attire and glowing with happiness and pride, the class of 2016 celebrated their graduation in true Waldorf fashion—with a host of performances that reflected their style, both as individuals and as a tight-knit class. Bravo, Class of 2016! We cheered you then, and we cheer you now remembering that fine day. Below is a compilation of photos and excerpts from our eloquent graduation speakers…thank you all for bringing grace, poetry, and wisdom to this special day for the class of 2016. Waldorf education has given you not only the courage to ask questions but also a thread to weave the tapestry of your life, a baseline to return to time and again, an inner guidebook to which you can refer in your upcoming travels. You will be able to recognize what is wholesome, real, and authentic because you have lived and embodied it all these years at school, with your peers and your teachers. May you always remember where you belong in your own heart. I have seen you walk hand in hand in the Great Meadows, run for your life at the Michaelmas games, turn green on a rough whale watch, stand expectantly in front of the bus departing for Hawthorne Valley, dance around the Maypole, compete at the Olympics. I have witnessed you “Be true to your aspirations, be true to your family and obligations, be a good knight”, play a gorgeous Beethoven piece at the Middle School Arts Evening, sing “Don’t Stop Believing,” elegantly dance at the Viennese Ball, and confidently roar in the Lion King, radiating energy, strength, and talent. What a fantastic, heartfelt, uplifting experience of aliveness this has been! Nadia Puttini, P ’16, is a grateful mother who feels blessed that her daughter could get this quality education. She is also the owner of BareSole Yoga Studio in Carlisle and has been teaching yoga in the Boston area for the past eleven years. Eighth grade, it is a delight to stand up on this stage with you on the day of your graduation. I know that you’ve all worked very hard throughout the years to arrive at this moment in time, and whether you’re boldly anticipating the next chapter in your lives, or you’ve been dreading this upcoming transition, or even if you don’t really know how to feel in this moment and you’re just going with the flow, I think everyone here can acknowledge the significance of capping off eight formative years of your education. You have all accomplished something big, and we’re all gathered here to celebrate you, at what will likely be one of the most eccentric, creative, and intimate graduation ceremonies of your lives. I graduated from college one year ago, and I remember basically nothing from the proceedings of that day, except that I was shrouded in black polyester in 90 degree weather. From my own Waldorf graduation, however, I have wonderful memories, and I can recall very clearly what performances my classmates gave, who went through a whole box of tissues, and even what some of them wore. My point is that today is special and weird and unique, much like most of your time at this school if we’re being honest, and not many people in their lifetimes will ever experience anything like this, so as we continue on throughout the day, let us take moments to pause and absorb what is happening around us, because we are surrounded by a special community, in a special space, and it’s not often that all of these aspects coincide. Graduation is a bittersweet time of happy memories, sad goodbyes, and lots of hugging. Before we go, I am going to take a moment to practice the attitude of gratitude, and speak on behalf of my class to express how grateful we are for the chance to grow up at this school. First I want to thank our wonderful teachers. Not only have you taught us how to sew pajamas, throw javelins, and play the winking game. You have also shown us what it means to be compassionate, respectful, confident, and creative. Even though some of us are now taller than you, we will always look up to you! And now, the remarkable Ms. DeNatale. Ms. D, you are the ultimate butterfly, bright and powerful. You came into our lives, shaped us, watched us grow, kept your calm (for the most part) and helped us reach our full potential. Since you have decided to take a break from teaching, I want to give you a suggestion for what your next career should be. I think you should be a superhero. You always seem to know what the class gossip is, who is about to get sick, and you can transport us through space and time with your awesome storytelling. You can stay in control of a room full of energetic adolescents (pretty impressive), you help us resolve conflicts with grace, and you make us feel loved. Whatever you decide to do in your life you will be great. And if you ever need letters of recommendation, I know at least 21 people who will be happy to help. I also want to thank our parents who got us out the door to school every day. We literally would not be here without you. After the parent breakfast last week, the 8th graders and our parents shared memories from our years at Waldorf. I want to give a special thanks to Elijah’s Dad, Todd for what he said. He told us that even though school is ending, he would always be there for us if we ever needed anything. Hearing him say that reminded me how lucky I am to be part of this Waldorf family. Because even though we won’ t be together every day, we will always be a community. I remember being ready for new experiences, wanting to move on to high school and venture beyond the walls of the Adams School building, but not without first packing all my classmates into my pockets and taking them with me wherever I went…. These are the people with whom you will forever share an intrinsic connection, and you needn’t ever fear losing these relationships, because they will always hold fast. Give a thank you to your parents and loved ones who have supported you through this unique education. You are some of the most dependable, capable, and well-rounded people that you will ever encounter. The class of 2016 enjoyed a wonderful graduation celebration as the final flourish of a remarkable school journey. They received a broad based, extensive, classical education sure to support whatever path of study they choose to follow in high school and beyond. The deep bonds of friendship nurtured over many years will continue to support these graduates for years to come. My heart is full of gratitude and real joy from simply basking in the upbeat, loving presence of these multi-talented students for so long. I miss them already and feel fortunate to have known each vibrant young person. I will be forever grateful to the generous and dedicated parent body. These families gave their children an opportunity to grow and transform into young ‘becoming adults’ by letting them savor an unhurried childhood... The gift of time, our most precious, limited resource.